In polymer applications and development, it is often necessary to modify an existing polymer structure in order to impart special end-use properties. Whereas chemical modification methods are most commonly practiced, sometimes enzyme-catalyzed modifications may be desirable because of the specificity of the reactions, reduction in the by-products produced, milder reaction conditions, and more benign environmental impact. A number of enzyme-catalyzed reactions are reviewed in this paper, covering primarily biobased materials like polysaccharides, proteins, triglycerides, and lignin. The enzymes used include mostly hydrolases, oxidoreductases, and transferases, with occasional involvement of lyases and isomerases. The types of reactions are diverse and include polymer hydrolysis and degradation, polymerization, oxidation, glycosylation, cross-linking, and transformation of functional groups. Because biopolymers are agro-based and occur abundantly in nature, they are often available in large quantities and amenable to enzymatic reactions. 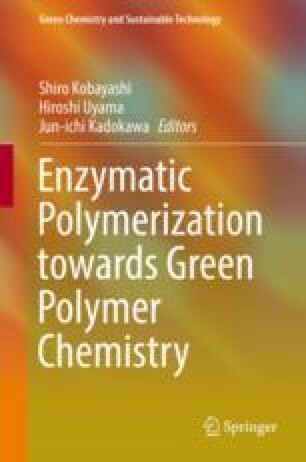 As such, the combination of biopolymers and enzymes represents a good product development opportunity and a useful tool for postharvest agricultural technology and green polymer chemistry. Thanks are due to Suhad Wojkowski for conducting the exhaustive literature search, Kaylin Kilgore for help with references, and Professor Shiro Kobayashi for his kind invitation to write this chapter and for his help with the chapter format. The author also thanks Dr. Qu-Ming Gu for the productive collaboration for many years and valuable input on this review. Mention of trade names or commercial products in this publication is solely for the purpose of providing specific information and does not imply recommendation or endorsement by the US Department of Agriculture. USDA is an equal opportunity provider and employer.